The Highest Quality Latex / LARP Daggers We've Seen! Raiders strike quickly, usually at night and always in lightning fast assaults. Their daggers are dark, simple and elegant. 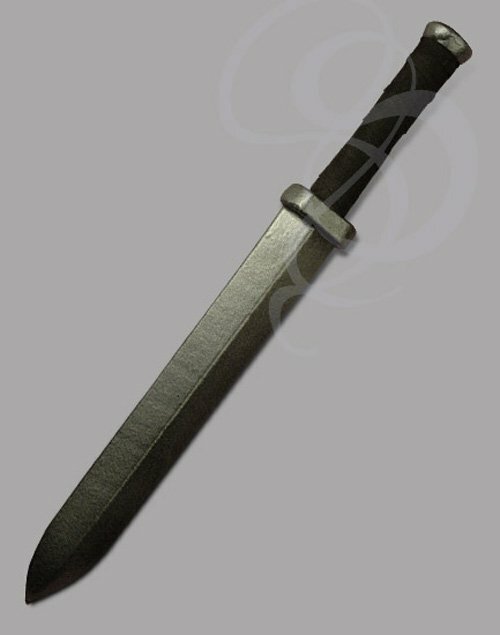 This Raider dagger is perfect for a wide variety of characters. It's perfect for low-level assassins and bandits, but works very well as a fighter's secondary dagger or a utility blade for any character type. Light yet sturdy, this is a great dagger at a fantastic price. Like all of our LARP daggers, the carbon fiber core is padded with a mutlidensity foam for more durability and spring action. The reinforced grip is wrapped with comfortable and attractive suede. Like most of our LARP daggers, there is a slight chance that the grip color will vary (although with this item, it's almost always black). In every industry, there is one company that towers above all others. Among dagger vendors, that company of course is Strongblade.com =D. But among makers of latex swords and daggers / foam swords and daggers, our manufacturer is without question the best in the world. The company, based in Scandanavia, is responsible for pushing the envelope in technology, aesthetics and safety. Once one of these daggers is designed, it is put through a minimum of six months of testing and refining before it is allowed to hit the market. These tests include moderate and extreme stress simulations, field testing, and SAT tests to ensure that the sword can get into a good college (lawyer's note: That last one is categorically not true. The daggers occasionally take the ACT tests, not SATs, and it is not a requirement of these tests)(editor's note: Our writer has gone insane. He is impersonating a lawyer and writing about swords going to college. Please ignore him. These daggers cannot take academic tests). Our manufacturer pioneered the use of round carbon-fiber cores in the mass-market, a technology that makes their sword astoundingly strong, flexible and springy. The cores feature special structural reinforcements around pressure areas like the joint between guard and blade. This prevents the dagger from breaking or folding at areas of high stress. Our manufacturer uses proprietary multi-density foam. This last, complex sounding sentence means that they use a small layer of dense foam around the core and a larger, softer layer of foam to make the shape of the dagger. This makes for a very safe dagger that can withstand incredible amounts of punishment. This also makes for a unique sword amongst the sea of other manufacturers who simply cast a mold, fill it with one layer of lower quality foam and call it a day. These daggers feature another design feature unique to them: A Vari-flex Tip design. This is a design feature in the tip that allows them to bend gradually rather than abruptly. Doing this prevents stress on the tip and makes it almost impossible to cause creasing or weak spots that could lead to breaks. I could go on and on. And come to think of it, I will for one more paragraph, because I forgot to mention the proprietary paint used on these daggers. Our manufacturer uses a revolutionary painting technique on these daggers that is engineered to reflect light exactly as real metal would. The paint is also designed to protect the dagger, providing a strong barrier that stretches slightly with each flex. If you don't get the idea by now, we're very excited to be offering these daggers. At Strongblade, we prefer to sell the products that we manufacture; this ensures that what we sell is up to our standards. So, when we decide to sell another company's products, it's most likely because that company is the best in the industry. This is clearly true of these swords. Buy these daggers and you are buying the highest quality latex dagger that we have ever seen. Its a plain and sturdy no-nonsense self defense tool. My larp wont let me trust with it (paranoid) but it looks good and performs really nice, a very nice piece to have when you run out of spells. I've abused it pretty mercilessly for I'd say a good 40 hours now and still looks brand new.